matures to a second generation remote - but is it enough? At first glance the remote seems to be floating within its oversized retail packaging, but upon closer inspection transparent fingers can be seen gripping it securely. Transparent light blue walls on five sides shield it from the outside world, yet allow an unobstructed view of its sleek ergonomic contours. Crisp white printing heralds this marvel as the “One For All Kameleon 8-in-1” and proclaims it to be “the easiest remote you’ll ever use”. If first impressions count for anything, the Kameleon 8 should prove rather interesting! The One For All line of universal remote controls have been standard fixtures in big box electronics retailers for many years now. With an extensive range of affordable and appealing models, often someone’s first dip into the universal remote pool will carry the black-and-red One For All label. Wide availability, button laden designs and slick packaging all help impart an image of professional design, sufficient capabilities and – most of all – that this remote will be a sound purchase. As it turns out, the One For All brand is but a single series of remotes designed and manufactured by a much larger company, Universal Electronics Inc. (commonly referred to as UEI). In fact, when you’re looking at that impressive wall of inexpensive remotes at your favorite store, chances are good that a high percentage of those products contain UEI technology, regardless of label. Which is one of the reasons why the One For All Kameleon 8 pictured here might seem oddly familiar. A short time ago we reviewed the Radio Shack 15-2133, which was the first remote control to feature UEI’s proprietary Kameleon display technology (read our full review). At the time of that model’s release in North America, the European division of One For All launched a very similar product. Now, One For All’s North American side has finally caught up with a Kameleon remote of their own: the 8-device $99 USD MSRP Kameleon 8, known explicitly as the URC-9960. So really – what is it? Let’s try again. 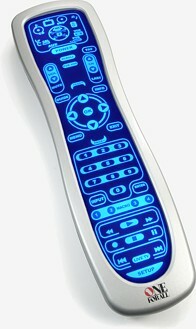 All modern LCD touchscreen remotes feature some form of backlighting behind the LCD panel. The LCD panel is used to generate characters or graphics, while the backlight function is to make the screen readable in the dark. Typically, the backlight used for black-and-white LCD remotes is a large sheet of material that glows blue, green, or somewhere in between when AC power is applied. This is known as an “electroluminescent” or “EL” type backlight, a technology frequently seen in PDAs, watches, power-saving nightlights and even car dashboards. Now, take the glass LCD panel out of the equation and, instead of leaving the backlight as a solid glowing sheet, divide it up into numerous smaller regions that only glow when activated. Top the EL sheet with a printed overlay that turns the illuminated segments into legible text and icons, sandwich the whole soft assembly over a membrane keypad, and voila! – a Kameleon.